I’m going to show a photograph I took. Hundred bucks if you can guess what I saw that blew my mind. On Black Friday weekend (pure coincidence), my parents and I took a day trip out of Barcelona to the wine region of Penedes, just to the west. 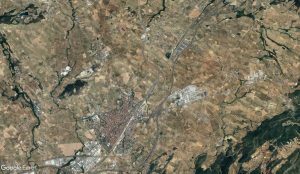 The valley is stunted, the sun is bright, and the entire region looks like a quilt from space. Vilafranca de Penedes’ highlight is the town square (Placa de Jaume I), which, aside from the obligatory gothic-dressed-in-romanesque cathedral, has a place called the Vinseum– both a museum of the region’s wine industry and a wine bar and tasting room. Where do you think we gravitated? Hang on. Back up a moment. One of my favorite books is Through The Language Glass by Guy Deutscher, and the fascinating story about descriptions of color in language. William Gladstone, a 19th century British politician and Homer fanatic, famously discovered that the way the Greek poet used color in his epics was strange. The emblematic example is the “wine-dark sea,” an image that will change how you read the Iliad. Guy Deutscher himself was inspired to try an experiment on his young daughter, and avoid telling her that the sky was blue for many years, then asking her the question out of the blue (boom) well after she had acquired language. Apparently, the girl fell speechless as she searched for a color match, and eventually settled on “black.” Radiolab features this same story in their Colors episode. Red seas and black skies have stayed with me for years. 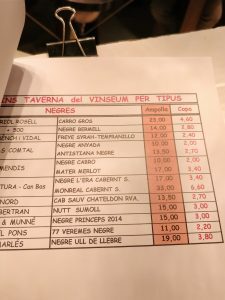 Sitting there at the bar, I realized that “tinto” in Castillian means “ink.” And “negre” obviously means “black.” The connection was clearer with Catalan, which it turns out is linguistically descended from Latin and NOT from Castillian Spanish (of which it is more like a sibling). Did the Roman settlers of this land, those profligate consumers of wine, also describe their wine as black? Is it possible that the peculiar texture of wine, its slight viscosity, its iridescence, its manifestation of growth and decay in nature, all of the things it embodies as an object (shout out Timothy Morton and OOO), all give it a depth of meaning which in ancient times could not be simplified to a color more associated with blood? Is it possible that wine was ORIGINALLY black?